The most compelling ceramic Speedy, with a customised cal. 1861 to boot. Launched five years ago, the all-ceramic Dark Side of the Moon (DSOTM) is one of the most definitive Omega Speedmasters of this generation. 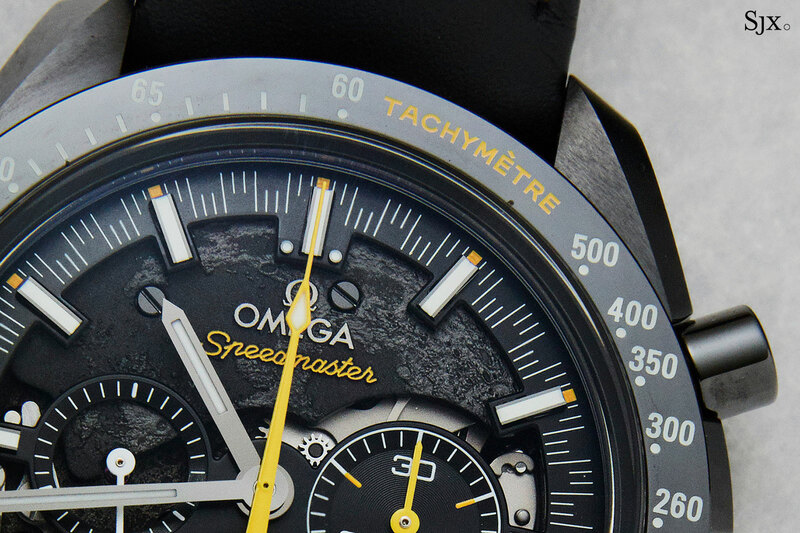 Back then the idea of an blacked-out Speedy would have seemed like an attempt to turn a tired workhorse trendy. But it wasn’t just a black-coated Moon Watch, instead the original DSOTM had a ceramic case, dial and even buckle, as well as a top of the line automatic chronograph movement, making for a confoundingly magnificent watch. Its success had since spawned many, many other Speedmaster “Sides of the Moon”, perhaps too many for a traditionalist, though those were all variations of the same watch. 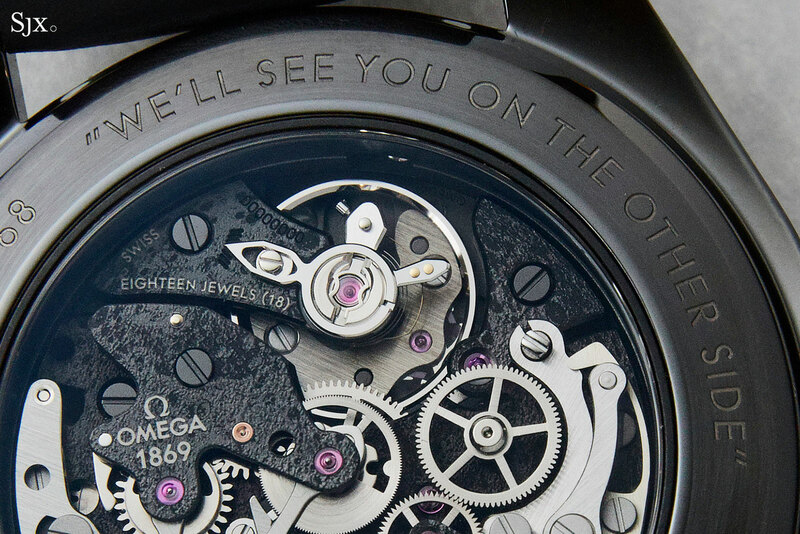 This year, to mark the 50th anniversary of the 1968 Apollo 8 mission – the first manned craft to orbit the Moon – Omega unveiled a special edition DSOTM that delivers a host of meaningful tweaks for a substantively different “side”. Though the new Speedmaster retains all the signature design features, and movement of the Moon Watch, the Apollo 8 is a completely different beast. 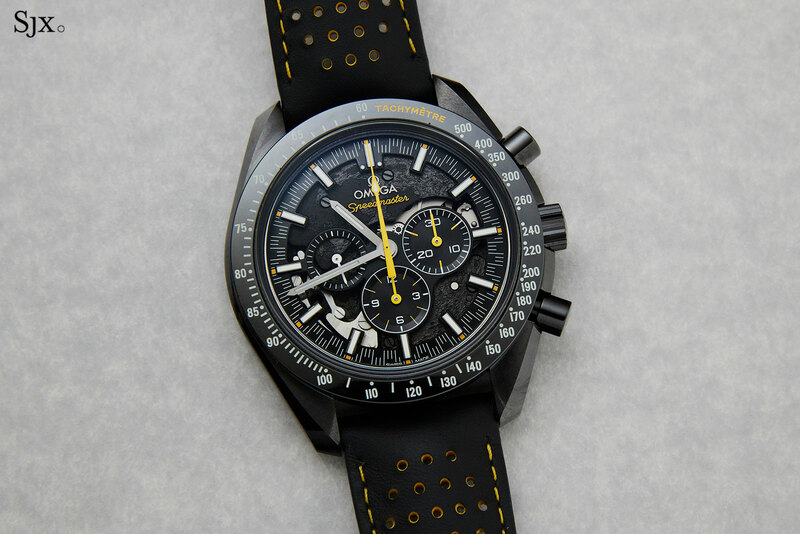 In fact, it’s a major twist on the original Moon Watch, a Speedmaster that takes the Moon landing association lightly. 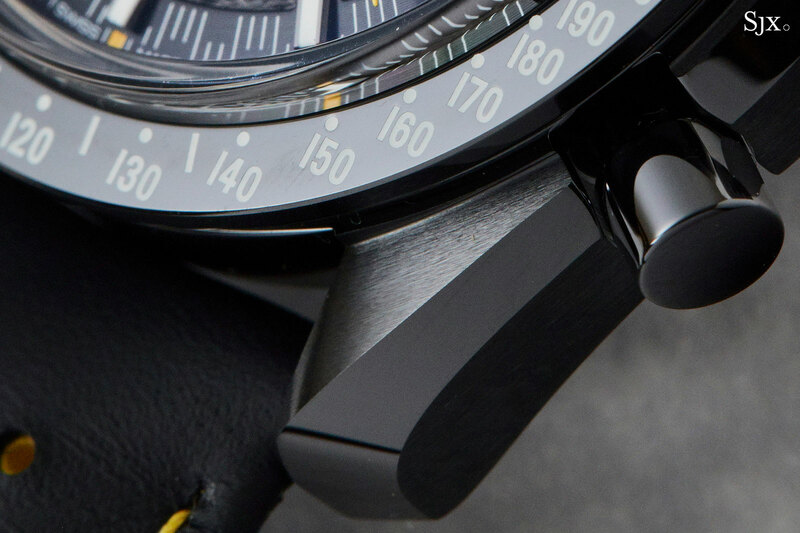 In keeping with the DSOTM series, the Apollo 8 still has the same 44.25mm zirconium oxide ceramic case. Though it’s significantly larger than the Moon Watch, the size is not apparent due to the dark colour of the case and dial. Practically everything on the outside is ceramic, including the bezel, crown, pushers and case back. The ceramic is sharply finished, with alternating brushed and mirrored polishing, giving it a precise surface that resembles metal. But that’s where the similarities end. Unlike earlier DSOTM Speedmasters which were powered by the two-register, Co-Axial calibre 9300, the Apollo 8 Speedmaster houses the old school, hand-wound cal. 1861 (derived from the Lemania 1873), the same movement found in the current iteration of the classic Moon Watch. But while the mechanics remain the same, it has been specially decorated for the Apollo 8, and christened the cal. 1869. 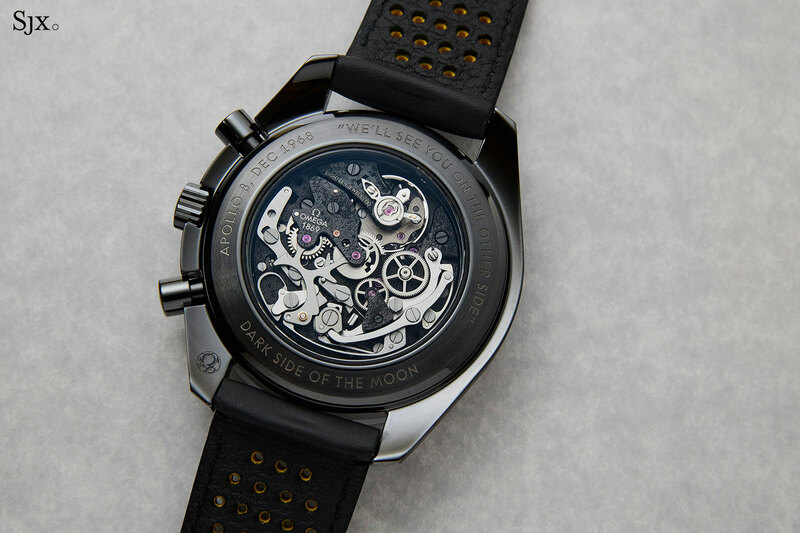 The most distinctive change, however, is the skeletonised dial, revealing the movement’s blackened main plate – matched with blackened screws – itself also open-worked and decorated via a process of laser ablation (removing the surface of a material via a laser) to achieve a topologically accurate surface of the Moon; basically a miniature replica of the Moon on the dial. And the relief Omega and Speedmaster on the dial are also executed with laser ablation. The same has been done for the bridges and main plate visible on the back, which replicate the other side of the lunar surface. The landscape of craters on the dial is a slightly lighter tone of black, depicting the Moon as seen from Earth, while the bridges on the back are one hue darker, intended to represent the dark side of the Moon. 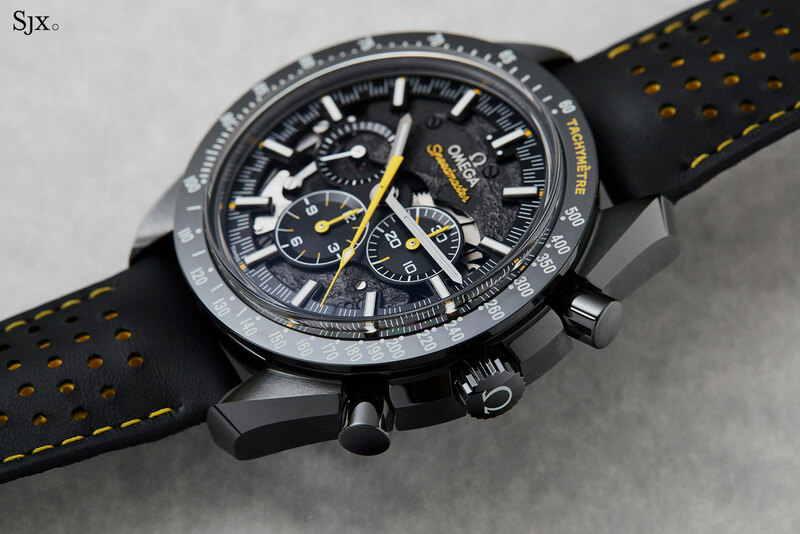 The watch also enjoys some striking yellow accents and a perforated strap that plays to the chronograph’s inherent association with auto-racing, had it not gone to the Moon. In fact, the black and yellow colour scheme is reminiscent of the Michael Schumacher “Racing” Speedmasters of the 1990s. 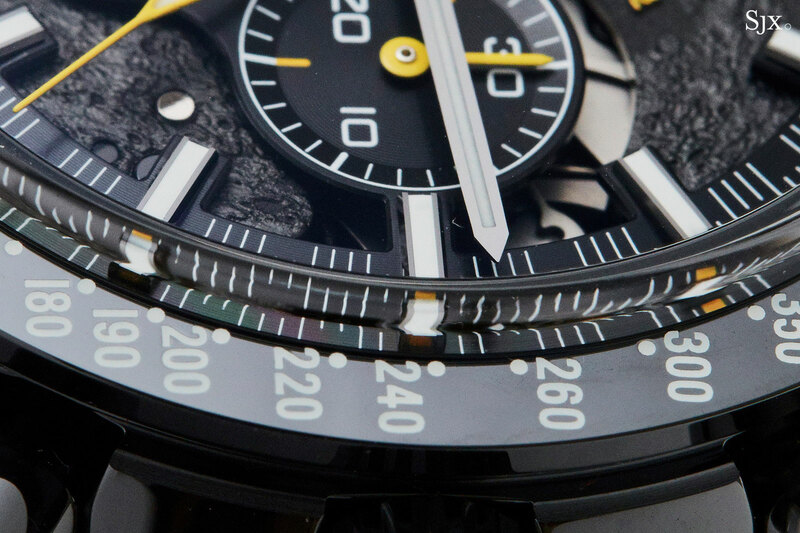 The hands, hour indices and bezel markings are filled with Super-LumiNova. More importantly, along with having a hand-wound movement that’s slimmer than the automatic in the other DSOTM watches, the Apollo 8 does away with the “box-type” sapphire crystals found on its cousins, which reduces its overall thickness to just 13.8mm – 2.5mm slimmer than the other DSOTM watches. Despite the unusual features, the Apollo 8 edition is not a limited edition, being part of the regular collection just like the other DSOTM Speedmasters. 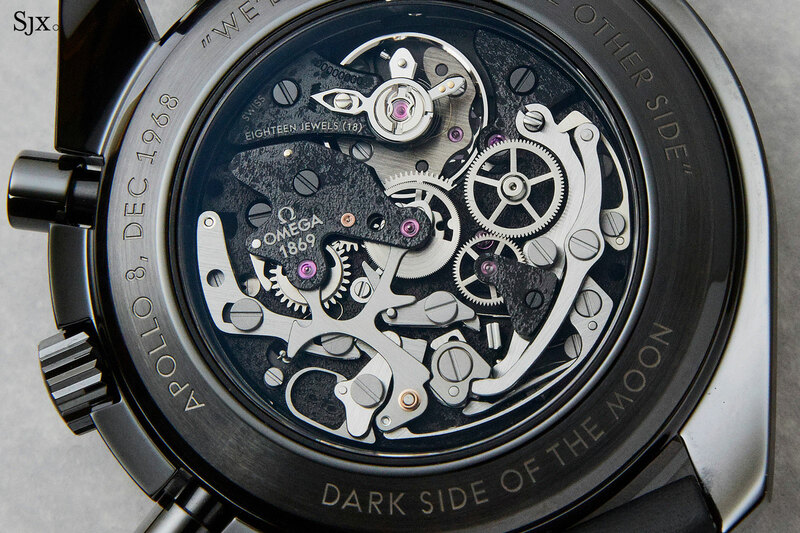 The Speedmaster Dark Side of the Moon Apollo 8 (ref. 311.92.44.30.01.001) is priced at US$9750 or S$13,550, and will reach stores September 2018.